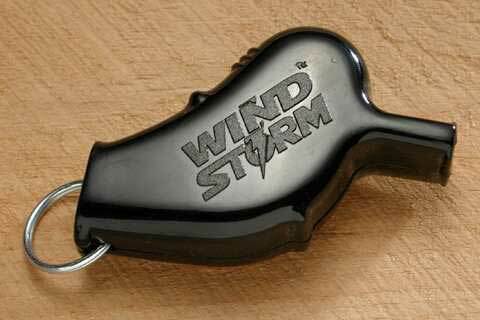 The All Weather Whistle Company Windstorm™ Whistle was developed for military use. This whistle will outperform all other whistles with a decibel power rating of 94.7, while focusing nearly 100% of harmonic energy at the optimum 3250 Hz range of other high powered whistles. Wind Storm works in all conditions, in any weather or safety situation: blown and heard on land, up to 1/2 mile, and even underwater, up to 50 feet. A high-impact, non-corroding thermoplastic protective housing is easy to grasp, and the patented double chamber design allows it to be blown when held right side up or upside down, forcing all water to be purged when the whistle is blown. The WindStorm is tuned to 3250 hertz which enable these whistles to penetrate through glass, into the most soundproof car, sound over the roar of a unruly crowd and be heard over the clamor of crowds and scream louder then machinery. Security detachments, Peacekeepers and Police have all benefited from the Windstorm whistle's power to produce a loud clear alarm, produce it easily, and produce that alarm in any conditions. Works in or under water and easily purges itself of sand, mud, snow. Loud enough to be heard over the engine roar of rescue helicopters, under the surface by divers and for great distances on the water or land, Made of thermoplastic with lanyard ring. EXTREMELY LOUD - THIS IS NOT A TOY! KEEP OUT OF THE REACH OF CHILDREN.